Cute ball shape artifical bonsai tree for perfect home/office/shop decoration. Suitable weight and size make it easy to place in various locations at home. Eco-friendly plastic and paper pulp material makes it easy to care and you just need to clean it regularly. PREMIUM MATERIAL-Compose of high quality plastic tree, wooden pole and paper pulp pot.Beautiful,durable,safe and eco-friendly. 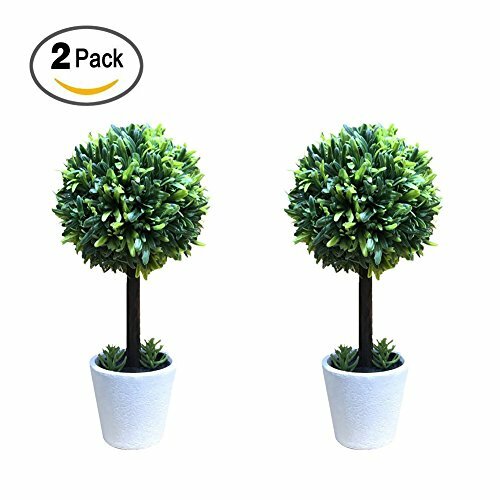 CUTE DESIGN- Cute ball shape, exquisite green leaves,and practical pot make it a perfect choice for home and office decoration. MULTIPURPOSE-Perfect decoration for office, shops, study room, living room, bedroom, bathroom. Placeing it at night table, desk, closet , wardrobe and so on.Make your home,office,shop more vivifying and comfortable. EASY TO CARE-Different from real plant pots, artificial tree don't need much time to care. It won't be withered because of your negligence. You just need to clean it regularly and it will keep living and beautiful. MULTIPLE CHOICES-2 shapes and 3 size make you more choices. You can choose the suitable one to decorate you home and office better. If you have any questions about this product by GOBEAUTY, contact us by completing and submitting the form below. If you are looking for a specif part number, please include it with your message.